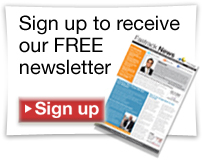 it is with pleasure that I introduce to you FXStreet’s “One Day, One Topic” webinars event. I am among the 5 speakers invited to talk, during one day, around one same topic: ORDER FLOW. And of course… all for free! Order Flow is about predicting the future flow of orders that will be generated so that you can position yourself to take advantage of the resulting price moves. A few ways order flow is analyzed are reviewed. The practical anticipation of the order flow through modeling of Algorithms heavily active in modern markets – so that a prepared trader can take advantage of it – is then discussed. A final reality check on what classes and families of Algorithms can be leveraged and used in our trading edge, and those that are too fast to be exploited is offered. Chris will discuss the impact of contributor banks on the interbank aggregate feeds. The price delivery risk management system of every investment bank plays a role in interbank aggregate price surges. We will discuss consistent price behaviours that may be useful in your trading model. During this session, Sam will share some strategy logic and rules for trading using price and price alone. The key is quantifying the markets real supply and demand equation and focusing on price levels where supply and demand is out of balance. This allows you to predict market turns and market moves in advance with a very high degree of accuracy. Sam Seiden developed the Patented Supply and Demand strategy more than 20 years ago during his time on the floor of the Chicago Mercantile Exchange. He started his career focused on the FX market and began on the financial institution side of the business which helped him understand how markets really work and how money is really made and lost in markets. Join Sam as he shares his strategy rules which help you trade the FX market like a bank. This session will focus on an interactive lesson and live strategy application. Since massive irruption of HFT machines (High Frequency Trading) has changed the classical way of Market Understanding, advance Innovative Techniques are required to adapt to this recent changes. 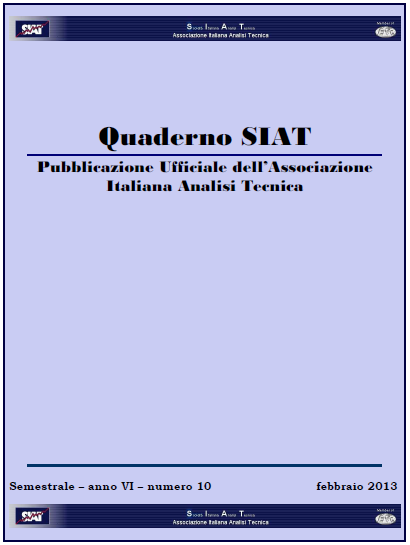 In order to achieve a successful trading performance, particularly in the shorter timeframes like Scalping, modern strategies like Tape Reading, Order Flow Reading, or Order Book Reading, have proved to be effective to reach this goal. Predatory Algorithms, need to fill thousands of Orders every millisecond, their activity, will provide us with an excellent starting point, as their big Volume Orders, will leave a Footprint that we can use to trigger our piggy-back System. We will use the Market Profile Auction Theory in conjunction with Innovative Systems, to develop a successful Low Risk High Probability Set Up’s to be profitable in our Trading. If it’s the first time you attend a webinar on FXStreet, please read our instructions. I like helping traders at all level of development “level plain” the trading game showing what banks, institutions and big hedge funds are actually doing (and not what they are saying they are doing). Follow my work to learn how to spot the Algorithmic Trading footprints. I am working on presentation of one event planned for next Wednesday December 10th, 2o14 on FXStreet.com. There is a lot of talking about Order Flow lately. The topic is important and is clearly on the mind of a lot of traders. Need a proof? Well, FXStreet.com is going to dedicate a full day on the topic this Wednesday December 10th. This clearly shows that the topic is currently front and center in the Forex trading stage. But what is Order Flow? When I started learning from my mentors and studying Algos I had no idea I was embarking onto a discovery that would change the way I would look at the markets, forever. The point is that I did not know anything about Order Flow and, even less, I knew about the techniques used to track Order Flow. But by looking at the effects of algorithms on price, I was also indirectly looking at the effects of Order Flow present in the market. See, I am much more interested to observe and act upon the effects of Order Flow, rather than looking at the Order Flow itself. Why I say that ? Because a particular Order Flow configuration will not always translate necessarily into a durable price move, which is what we need to make money. So it is always better to focus on price dynamics. And verify whether participation of Algos in larger timeframe in the direction of the setup (you are trading price retraces right? aren’t you?) is capable of winning the resistance of the opposite counter-trend move. Regardless of how we measure Order Flow. Because, again presence of orders is never a guarantee that price will have the momentum to create those very conditions that offer us low risk or free-risk trade and the opportunity to hit a swing target. That’s what we look at in our decision making as traders. 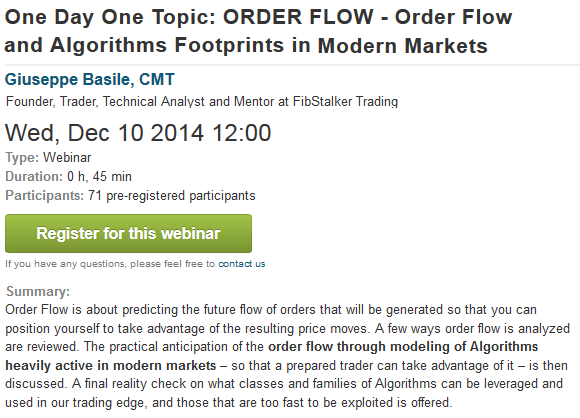 I will be touching more on the relations between modern Algorithms trading on high-volume markets and Order Flow in the webinar planned for this Wednesday December 10th, 2014 on FXStreet.com. Take a note in your calendar and register for the webinar today. Believe me. This is something you don’t want to miss! 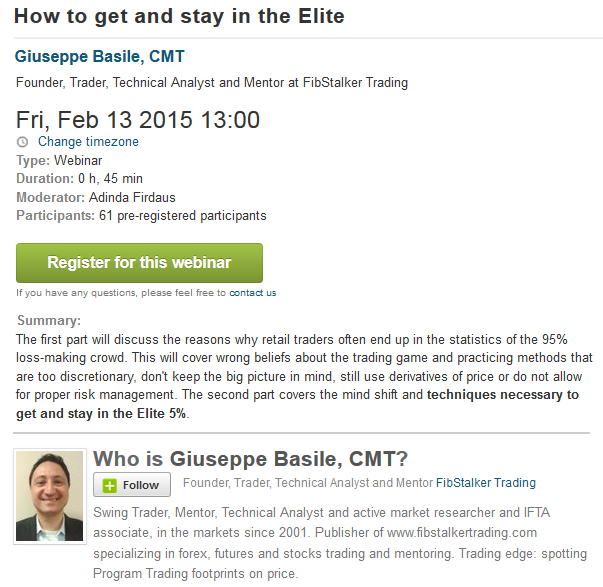 So here is for you my personal invitation to join the free webinar on FXStreet.com. I create a lot of free and unique content to help traders improve their trading. Again, don’t miss this webinar. It is going to help you making one of those important mental shift. Don’t you think you need that? Well, to shift the way we think about trading is paramount. How would then be possible to produce non-average results without new ways of looking at the market? Have you ever wondered why it is so difficult to achieve non-average results in trading (which means losing money consistently)? Because you need to look at the market differently and start doing things differently! I promise this webinar is going to add for you another little push and ideas to help you finally realize this change. I am doing it already, with great results, with traders who take my FibStalker Methods Coaching Program, and will help you too with this webinar. And that’s a promise. See you at the event. And if you want to learn more about my FibStalker Methods Coaching Program, the next session of this 7 month program is starting on January 10th, 2014. If you are interested, just reply to this post or send me an email to fibstalker@gmail.com with the words “more info” and I will be happy to come back to you. I reply to all my emails personally. PS: do no forget to join the webinar. Just click here to register. Thank you. I like to help traders at all level of development “level plain” the trading game showing what banks, institutions and big hedge funds are actually doing (and not what they are saying they are doing). Follow my work to learn how to spot the Algorithmic Trading footprints. Let me ask this straight. Are you part of the 5% of traders who make money regularly and consistently in the markets? If so, congratulations, you can close this page and go back to trading. But if you are not, you are not alone. These are the statistics: of the remaining 95%, around 10% is known to breakeven or slightly lose and 85% consistently lose money. As of today an average of 22% still do not use a stop loss and, as a result, they get margin calls and lose their capital (recent source: OANDA). In Western countries new and intermediate traders lose, in average, between $2,000 and $6,000 USD in 3 to 6 months. So, let me ask you: what are you doing differently or what you plan to do differently to not be or become statistics? Join my free Webinar next Wednesday 10, to see the relation between Order Flow and Algorithms. In my trading I model Algos that can be used to frame price structure and for “price discovery”, thanks to the existence of Program Trading a powerful family of Algorithms active on all timeframes in several high volume markets..